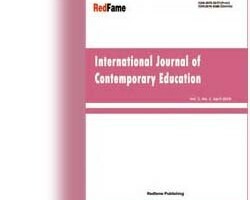 International Journal of Contemporary Education (ISSN: 2575-3177; E-ISSN: 2575-3185) is a peer-reviewed, open access journal, published by Redfame Publishing. The journal is published semiannually (April, October) in both print and online versions. The journal accepts article submissions online or by e-mail. IJCE aims to promote excellence through dissemination of high-quality research findings, specialist knowledge, and discussion of professional issues that reflect the diversity of this field. Authors are encouraged to submit complete unpublished and original works, which are not under review in any other journals. IJCE is striving to provide the best platform for teachers and researchers worldwide to exchange their latest findings.